The New York Mets are a Major League Baseball team based in Flushing, in the New York City Borough of Queens. They play in the Eastern Division of the National League. 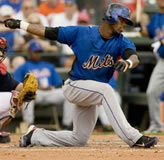 The Mets are one of two major league franchises in the City of New York, along with the New York Yankees. The Mets have won two World Series Championships in their 46 year history, the first in 1969, the second in 1986. 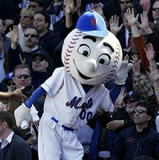 After the 2004 season, Mets ownership made significant changes to their management strategy. With their television contract with the MSG Network expiring by the end of 2005, they announced plans to establish their own cable network to broadcast Mets games, rivaling the Yankee-owned YES Network. This investment in what became known as SportsNet New York was coupled with an aggressive plan to upgrade the performance of the team on the field. Jim Duquette was replaced as general manager by former Expos GM Omar Minaya. Minaya, an ex-Mets assistant GM, achieved notable success in Montreal by making bold player moves on a limited budget. 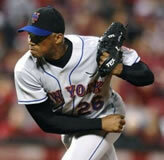 With the Mets, Minaya was given substantial financial resources to develop a winning team by the time the new network launched in 2006. Minaya began by hiring Yankee bench coach Willie Randolph as manager, then signed two of that year's most sought-after free agents — Pedro Martínez and Carlos Beltrán — to large multi-year deals. Though Beltrán underperformed, Martínez and a rejuvenated Tom Glavine led the pitching staff while Cliff Floyd's power, Jose Reyes' speed and David Wright's hitting sparked the offense. Despite an 0-5 start to the season, the team finished 83-79, finishing above the .500 mark for the first time since 2001. After 2005, the departure of Mike Piazza gave Minaya enough financial flexibility to take full advantage of a payroll-reduction effort by the Florida Marlins. All-star first baseman Carlos Delgado and all-star catcher Paul Lo Duca were acquired from Florida in exchange for five prospects. 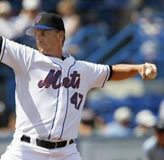 Minaya also improved the bullpen by signing star free agent closer Billy Wagner. Minaya's offseason moves and his organization of the team during the season paid off in 2006, as the team, led by a franchise record six All-Stars (Beltran, Lo Duca, Reyes, Wright, Glavine, and Martínez), won the division title, their first in 18 years. The Mets led the division from April 6 on, and built a lead as high as 16 1/2 games, before clinching the division on September 18, becoming the first team in the major leagues to clinch a 2006 playoff berth. The Mets finished the season 12 games ahead of the Phillies, and with the best record in the National League. The Mets achieved this success despite a slew of injuries which included losing Martínez for a month, and starting fifteen different pitchers in games. A 9-1 June road trip through Los Angeles, Arizona and Philadelphia was a turning point for the season. The Mets 2006 division title ended the Atlanta Braves' streak of 14 straight division titles, and they became the first team besides Atlanta to win the National League East title since the 1994 division realignment. 2006 was also the first time ever that the Mets and Yankees each won their respective divisions in the same year. Both New York teams also had the best records in their respective leagues, 97 wins and 65 losses. Despite losing Pedro Martínez and Orlando Hernández from their starting rotation due to injury just before the start of the post-season, the Mets swept the Los Angeles Dodgers in the 2006 National League Division Series, relying on their bullpen (with the lowest regular season ERA in the National League) and their potent offense. But the over worked bullpen finally faltered and the offense failed in key moments in the 2006 National League Championship Series, and the Mets lost to the St. Louis Cardinals, the eventual 2006 World Series champions in seven games, with the decisive blow coming on a ninth-inning home run by Cardinals catcher Yadier Molina. In the 2006 offseason, the Mets signed veteran outfielder Moises Alou to replace Cliff Floyd in left field and provide a right-handed bat in the middle of the lineup. In 2007, the Mets started their season with a three-game sweep over the St. Louis Cardinals to avenge the Cardinals' ninth inning triumph in game seven of the 2006 NLCS. With this win, the Mets maintained the best winning percentage on Opening Day in the entire league. In June 2007, the Mets play 19 straight games against 2006 playoff teams, facing the Tigers, Dodgers, Yankees, Twins, Athletics, and Cardinals. The Mets have the toughest 2007 interleague schedule of any team in the majors, with their interleague opponents having a 2006 winning percentage of .590.